Papaya– It tops the list for obvious reasons. Raw or semi ripe papaya contains latex which can induce premature contractions and that can be dangerous for your baby. However, ripe papaya is rich in vitamins and iron. Consuming it in controlled quantity will possess no harm but totally avoid eating an unripe papaya during pregnancy. Pineapple– These are also not recommended to the pregnant women as they contain certain enzymes that alters the texture of cervix which could induce premature contractions. This can result in miscarriage. Apart from inducing such effect, it is also notorious for causing diarrhea and that can be very uncomfortable during pregnancy. Grapes– Grapes aren’t recommended for consumption during the final trimester. They are known to generate heat in the body which is not good for both mother and the child. Avoid consuming too much grapes during your pregnancy to stay clear of any complications. Watermelon– Rich in water content, helps maintaining electrolyte balance. Bananas– Rich in carbohydrates, prevents anemia and helps maintaining colon health. Oranges– Keeps you hydrated and are rich in Vitamin C. Avocados- Rich in healthy fats and contains folate which promotes healthy growth of brain in fetus. They are also rich in vitamin K, vitamin B, fibre, magnesium and potassium. Apples– Rich in fibre, vitamins and potassium. 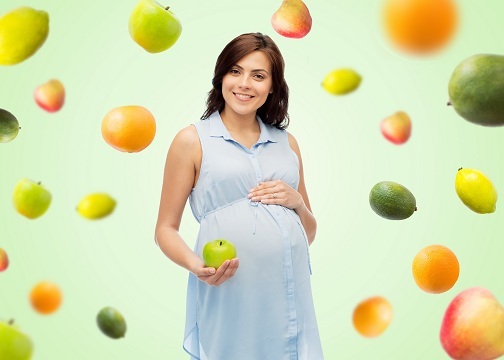 These are a few fruits that can be consumed during pregnancy diet. It is ideal to consume every fruit in moderate amount, once a day. This will provide the right kind of nutrients to your growing baby and keep their health in check. Try including more fruits in your diet. You can also consume a few with your each meal if you are not very fond of large fruit bowls. ⟵Can You Plan a C-Section Delivery?